July | 2011 | For the Love of Coupons! *Warning: contains a picture with some blood! After several weeks of bedrest for high blood pressure, I went into my doctor’s appointment on July 14th feeling off. I could usually tell when my blood pressure was going to measure high and that day was definitely one of them. 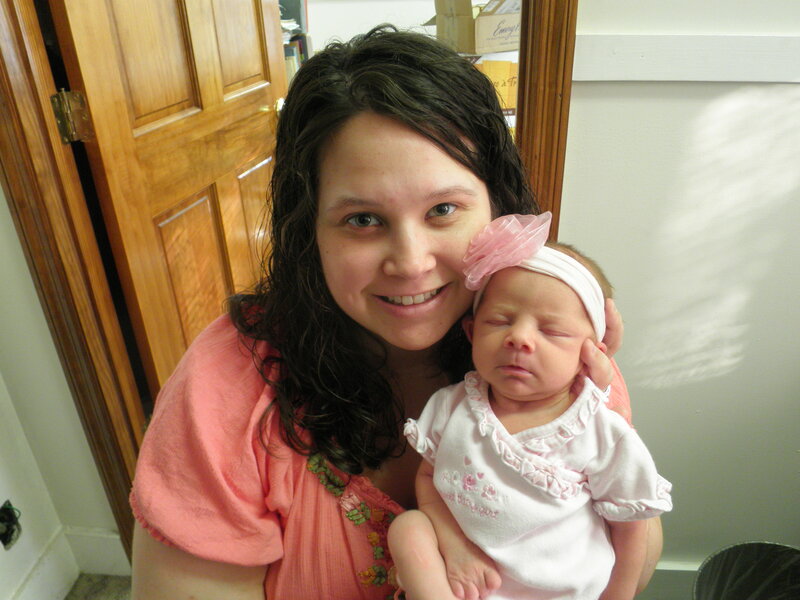 Up until my bedrest days, I had gained only 3 pounds past pre-pregnancy weight. When my high pressure started hanging around, I started putting on crazy amounts of water weight each week. This weigh-in at my doctor’s office was no exception, with 6 more pounds to add to my score. When the nurse took my blood pressure it was sky-high and when she took it again 20 minutes later it had not improved much. My urine sample came up positive for protein and my doctor decided to send me to the hospital for monitoring. We were at the hospital for a few hours that evening and my blood pressure eventually went down. They sent me home with a 24 hour urine test with instructions to bring it back at 10 pm the next day. I also got started on a prescription blood pressure medicine. It honestly made me a little upset that I got sent home that night. I just knew that something was wrong and that my pregnancy should be over. But, it wasn’t my doctor who made the call, it was the doctor who was on duty at the hospital that night. So, we went home and I had to pee in a jug the entire night and next day. The next day (July 15th) I felt bad all day. I was shaky, hot, and had a headache. Lance watched the kids I keep all day while I stayed in bed. I had to get up and watch one of the girls for an hour or so when he left for work. While watching her I started feeling even worse. I was nauseas and was shaking so uncontrollably. I read on the blood pressure medicine paperwork that you should call your doctor if you were nauseas so that’s what I did. He felt it was more than just the medicine making me feel this way and told me to go in again for more monitoring. Lance left work to come home and get me and I made sure our hospital bags were completely packed. I hadn’t taken them the night before to the hospital but I had a feeling we’d need them this time. My doctor told us to go in about 7pm and he’d let them know we were coming. Lance came home and shoveled down some food before we left. I didn’t eat because I was too nervous and sick. When we got to the hospital they quickly hooked me up to a blood pressure monitor that took my BP every 10 minutes. They were some of the highest numbers I had seen so far. Before all these problems my top number was usually around 90, this night I was seeing numbers as high as 208. I had to have an in-and-out catheter to get a pure urine sample to test for protein. Around 10pm my doctor came to the hospital to see me and talk to me about my situation. He told me that all signs point to Preeclampsia and that it was time to get the baby out. My being over 37 weeks pregnant was a good indication that the baby would be just fine coming early. He checked me and I was dialated to 1cm and 40% effaced. 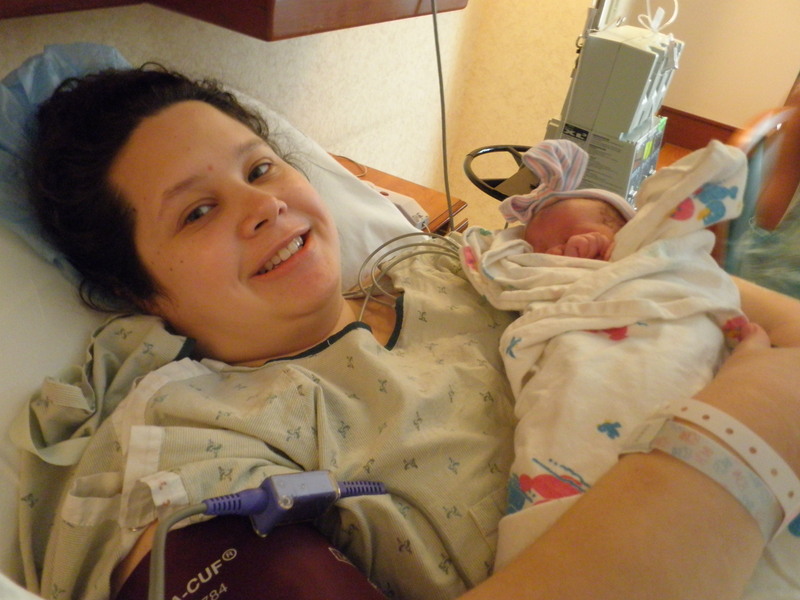 I was then admitted and moved to a Labor and Delivery room. At 11pm I was started on Cytotec to help soften my cervix. It also signaled my body to start regualar contractions. They were bearable, but not bearable enough to sleep through. Lance got some sleep and I just rested. 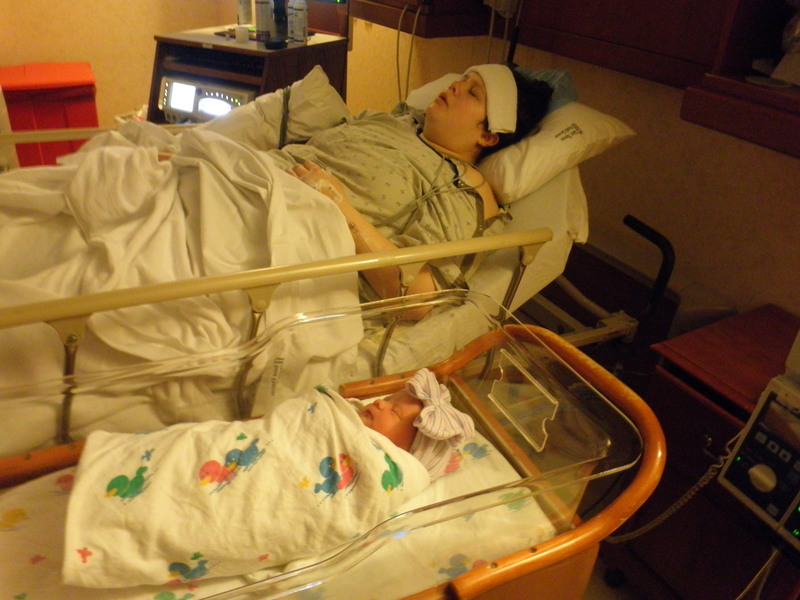 At 3am on July 16th, I was only dialated to 1.5cm and 60% effaced. Not a lot of progress. At 4:15am I got my second dose of Cytotec. My contractions started to get a little stronger and the nurse advised me that if I was going to get an epidural, to get it before the contractions got so strong that I wouldn’t be able to hold still for the procedure. So, around 5am I asked for my epidural. It took a lot longer to put in than you see on TV; about an hour and a half. I did let a student do it though, so that might have been why it took so long. She did a good job though and I got immediate relief. They started me on Pitocin and I got another cathetar (thankfully I couldn’t feel this one). My contractions got very strong and should’ve been enough to get the show on the road. But, by 3:30pm I was only 4-5cm dialated and had developed a high fever; a sign of infection. My doctor told me that he would give me one more hour to keep trying if I wanted to, but at that point I was pretty much done. I was so exhausted, felt sick and feverish, and was shaking like a leaf. I told him I just wanted to proceed with the C-Section. This is where I got really scared. 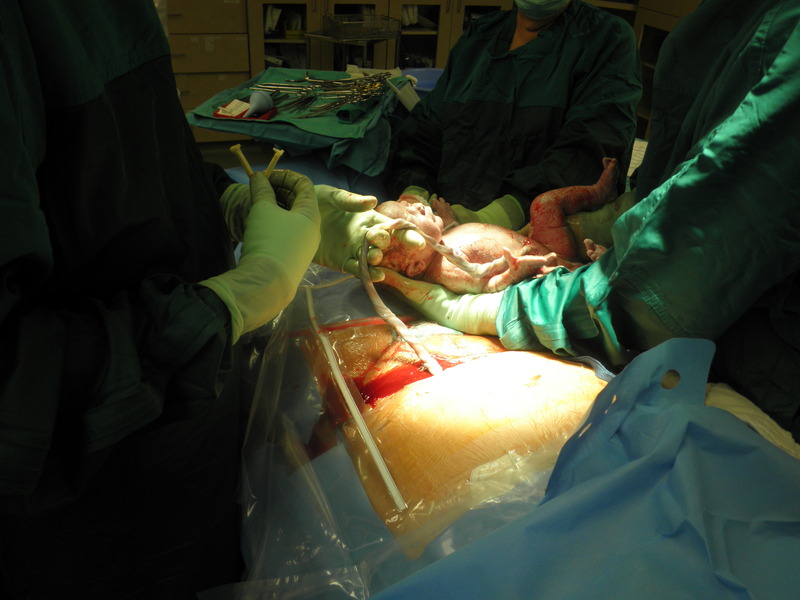 I had known that by having my baby early there was a good chance I wouldn’t progress and I would have to have a C-Section, but the reality of it hit me really hard and I was terrified. 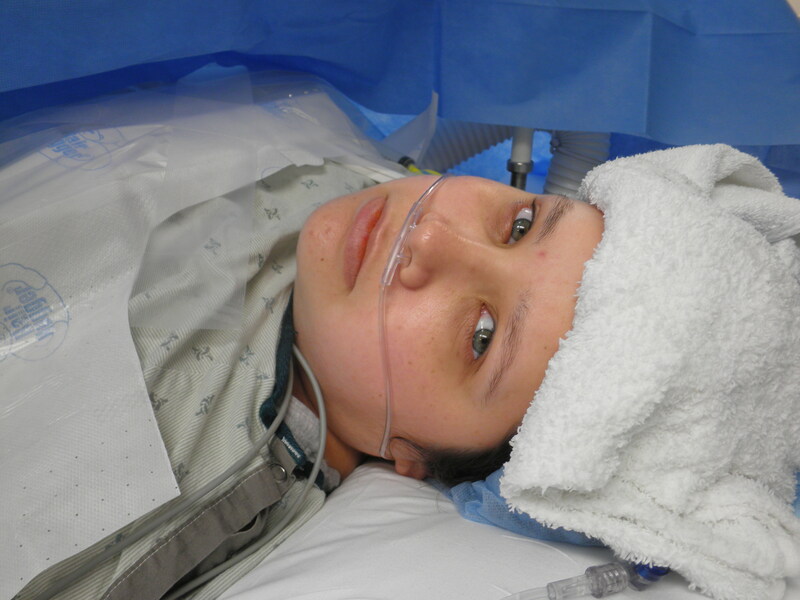 I have never had major surgery and the fear of the unknown overwhelmed me. I had a lot of people in my room and I was trying so hard to be brave, but all I wanted to do was break down and sob. I whispered to Lance not to be nice to me (haha!) because I was trying not to cry and he did great by just quietly stroking my hair. Quickly there were a lot of nurses in my room giving me new medicines in my IV and prepping me for surgery. I heard one nurse tell our family that they could wait in our room until we came back. I was wheeled back to the surgery room and Lance had to wait outside until I was on the table, covered up, and all ready to go. That was the hardest part for me. Having to be separated from Lance when I was that scared, for even just a few minutes, was horrible. He is my rock. After Lance was able to come in things moved pretty fast. I just laid there focusing everything I had on not crying and freaking out. 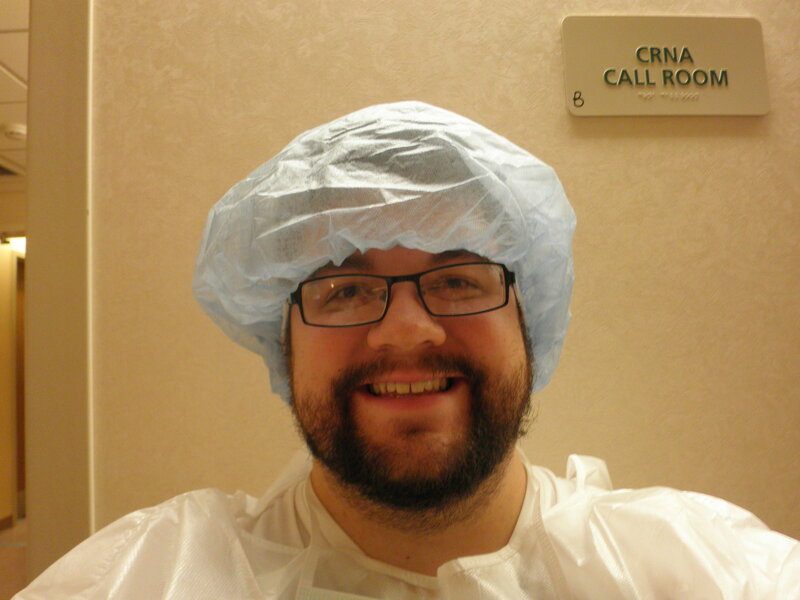 I think the only thing I said throughout the whole thing was to ask the nurse to put a washcloth on my head. I felt a lot of pressure and tugging at my abdomen, but nothing too bad. After a few minutes they told Lance to get his camera because she was about to come out! At 4:23pm I heard the sweetest cry I’ve ever heard in my life! Lance kissed me on my forehead and went to watch them clean her up. 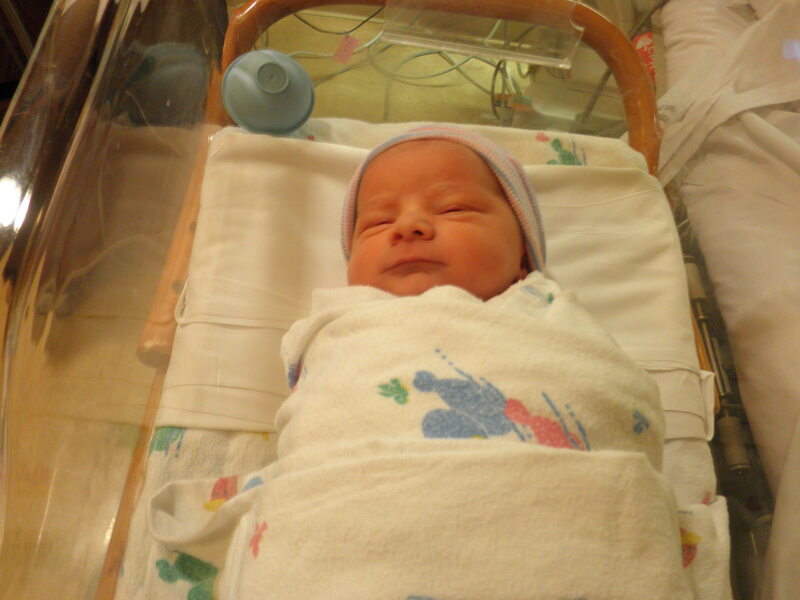 She was 6lb 8oz and 18.5 inches long. She was perfectly healthy! We found out she had the umbilical cord wrapped around her neck and that was why I wasn’t dialating. She couldn’t move down and we would’ve probably had to have a emergency C-Section if I had waited much longer. At this point I was feeling really out of it. I couldn’t keep my eyes open and was still shaking really bad. They handed Adelaide to me but I only held her for a minute because I didn’t feel strong enough not to drop her. The next 30 minutes or so was spent being stiched up while I dazed in and out and Lance got to hold our daughter. I opened my eyes every once in a while to look at them but was mostly out of it. I told the nurse that I didn’t want anyone in my room when I got back and she told me she’d take care of it. I just felt so sick and knew I couldn’t handle it. Family was starting to get anxious in the waiting room, but I really couldn’t handle visitors yet. 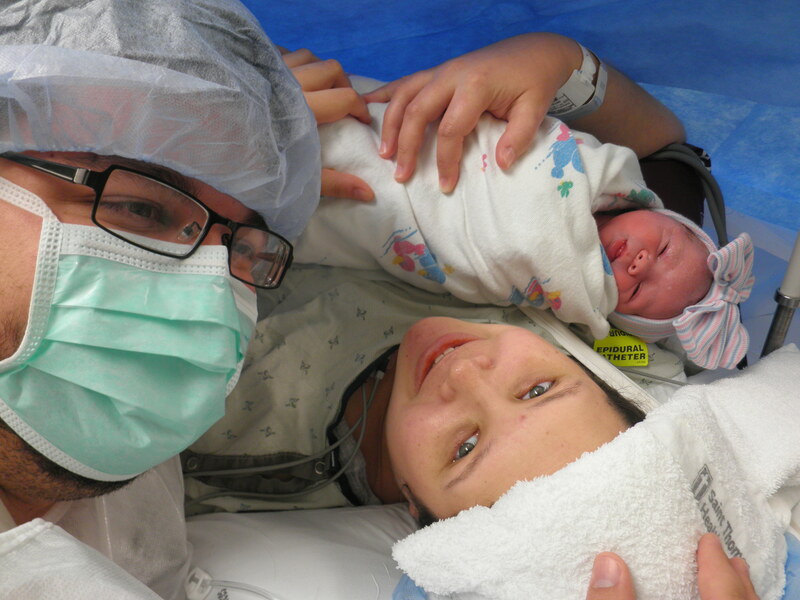 I also hadn’t even really gotten to hold her except for that minute in the surgery room. Lance text some pictures of her to help with the wait, but that wasn’t the same. Even though I wasn’t ready, I told Lance to go ahead and start bring people back and the nurse who was in there quickly interrupted and said no, I was not stable enough to have visitors yet. I was grateful for her saying that and now I had someone to blame the delay on besides myself. After another hour or so, I was able to start keeping my eyes open and got to hold my daughter for a few minutes. It was so awesome to finally hold her, but also bittersweet because I felt like I had missed so much time with her already. After family got to come back for a little while, the nurse told me that if I was going to breasfeed I needed to go ahead and try because it had been several hours since her birth and she needed to eat. I still felt really sick but was determined to get Adelaide off to a good start. We didn’t have to try very hard! She caught on the very first time and has been doing great ever since! That night was spent getting as much sleep as we could and me trying to recover from everything that happened. I’m so thankful that Adelaide is here and we are both healthy. Although things were scary and my hospital stay was frusterating for many reasons, I have been blessed with a beautiful baby who I can’t imagine life without. 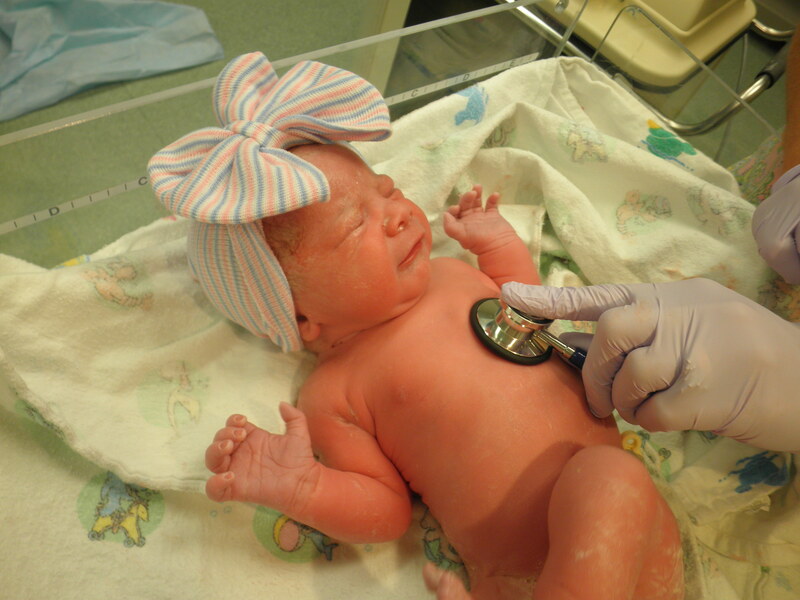 My daughter was born on July 16th at 4:23pm after I developed Preeclampsia. I was 37 weeks and 3 days pregnant. 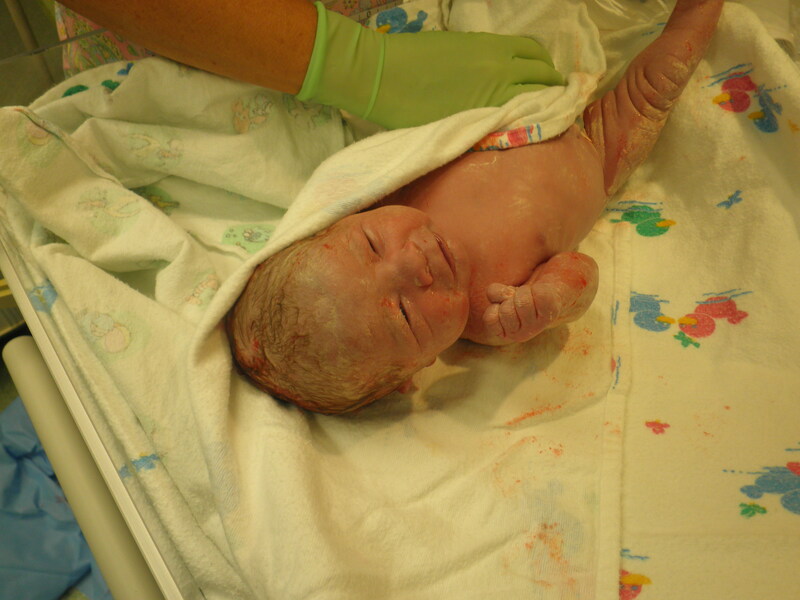 She weighed 6lbs 8oz and was 18.5 inches long. It was a crazy whirlwind of a day and I can’t wait to write her birth story so that I can remember the experience. But for now, I have to focus on sleeping when I can. Today I am 35 weeks, and 5 days pregnant. For 2 weeks now, I have been on bedrest for Pregnancy Induced Hypertension (PIH). Thank goodness we got the baby’s room painted and finished when we did! I would be going crazy if I still had a lot of stuff that needed to be done in preparation for the baby! Lance has been so great the past couple of weeks. His boss is being SO understanding and he was able to switch his work hours to the evening so that he is able to stay home during the day and watch the kids that I keep for me. We wouldn’t be able to afford this much time off. I haven’t had to clean the house, cook a meal, do laundry, or go grocery shopping at all. He has done it all! I have to admit, it’s been a little hard to give up the reins on some of the domestic stuff, but have definitely enjoyed the much-needed rest that I’m getting! Another blessing has been that our church has started bring us meals 3 times a week. That is such a huge help! It definitely makes things a little easier on Lance and I am really enjoying all the yummy food! It just makes this bedrest thing so much more bearable with everyone being so helpful and understanding. I go back to the doctor on Thursday for lab work and an ultrasound. They are monitoring me and the baby very closely to try and get us to as near to my due date as possible. I’m secretly hoping to be induced a little early. I’m getting really tired of being pregnant, honestly. But, of course, I want what’s best for the baby above any discomfort that I have!